This recipe came into being after inspiration was given to me by a friend. As is often the case, she said “I want to make some Viennese Whirls. Can you make some and blog them please so I can use your recipe?” Being the good friend I am, here I am blogging them! Truth be told, I’ve made these before but that was wayyy before I started this blog and the pic I have of them is shockingly bad. Perhaps I’ll post it sometime but for now it’s far too embarrasing. Recently, Jac from Tinned Tomatoes (fab foodie blog, get over there if you’ve not visited before!) introduced me to Silpat non-stick baking sheets. She was raving about them like they were some incredible invention but I’ve had silicone baking tray liners before and surely they’re all the same… How wrong I was! The baked goods just slide off the Silpat’s non-stick surface and even chocolate was no match for it as that peeled right off too. I think I’ve found my new kitchen ‘wonder product’; thanks, Jac! Of course, if you’re not convinced you can always use baking parchment. You don’t have to dip the biscuits but I think it adds an extra luxurious feel to them and it doesn’t take long. If I was being a fancy pants (and I like fancy sometimes!) I’d have sprinkled some chopped pistachios onto the melted chocolate after I’d dipped the biscuits but I didn’t have any, so I didn’t. I use flavoured icing sugar here from Sugar and Crumbs and you can easily vary the flavours by just choosing a different icing sugar. The traditional version would have plain icing sugar with a little vanilla extract in the mix. For this recipe, I experimented with a new product from the makers of Stork baking spread called Stork with Butter. I ALWAYS use Stork in my cakes as I find it gives a lighter sponge and better flavour but some prefer the flavour of butter. 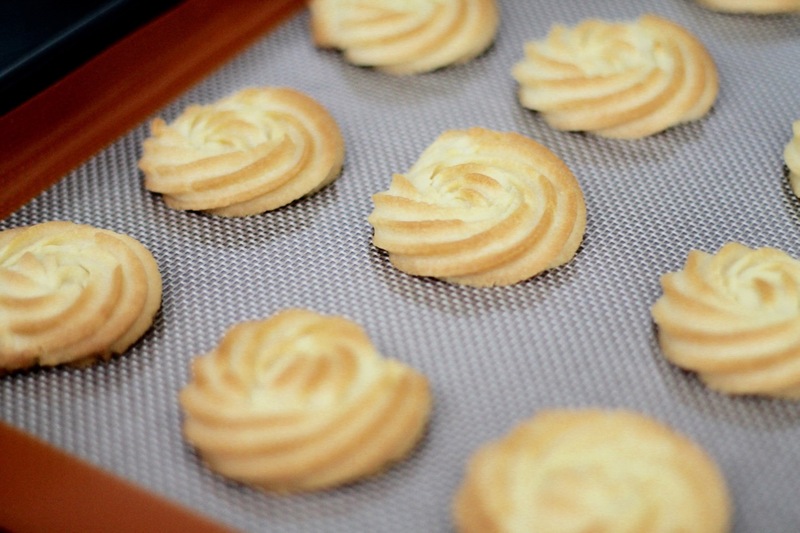 In a Viennese Whirl I like the flavour of butter to come through, but using butter can make the mix too stiff. I found that Stork with Butter gave a lovely buttery taste and was also the perfect consistency for this recipe. If you haven’t tried it, I think you should give it a go! These delicious biscuits aren’t from Vienna, they’re actually from East Anglia! Wherever they’re from, they are really delicious. 1. Place the butter or baking spread, plain flour, cornflour and icing sugar into a bowl and mix either with a mixer or by hand. Cream well so the mixture is reasonably soft – it needs to be piped so can’t be too stiff. 2. 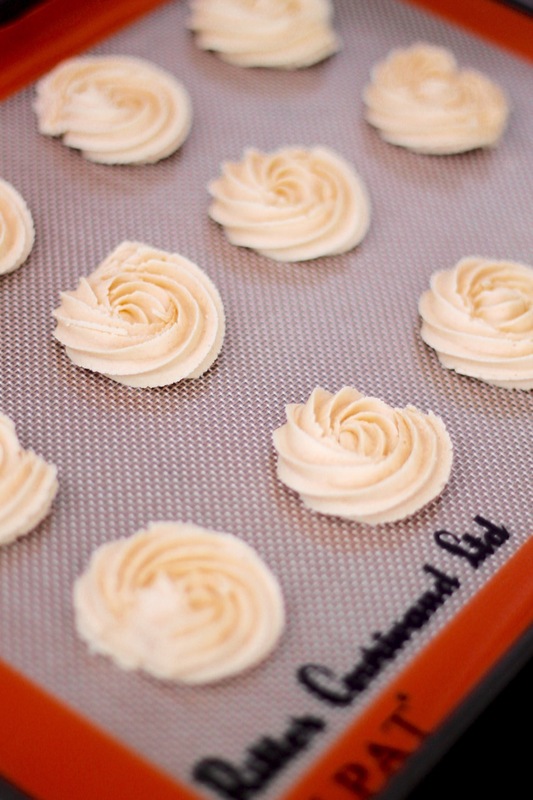 Pipe the mixture into rosettes on a non-stick sheet or baking parchment. I found it easiest to start at the centre and work out in a spiral as if making buttercream roses but I’m sure they are lots of other ways to do it. 3. 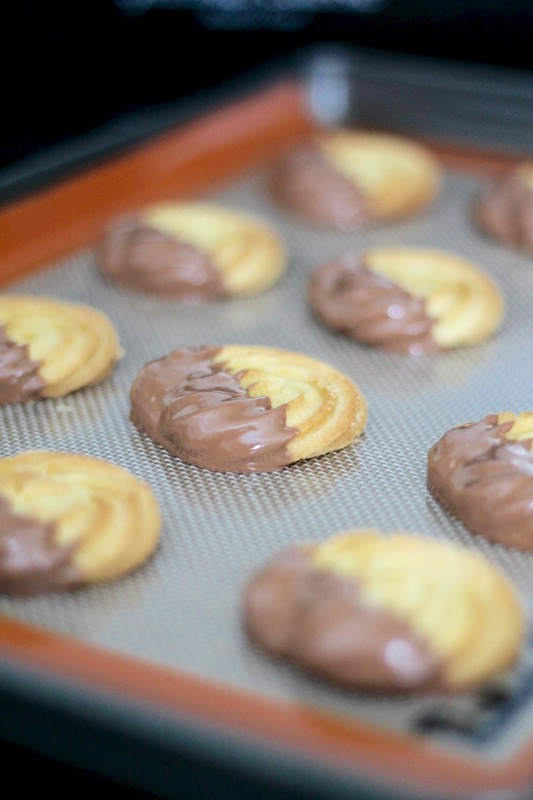 Bake the whirls at 180ºC Fan for around 12-15 minutes or until pale golden brown. Remove from the oven and leave to cool completely. 4. Melt the chocolate in the microwave in short bursts and then dip the biscuits into it, placing them back on the tray to set. You may need to use more chocolate than stated to get a deep enough pool for dipping. 5. Once the chocolate has hardened, you are ready to make the buttercream. Simply place the butter or baking spread and icing sugar into a bowl and cream together, adding a little water to loosen if needed or a little more sugar if too loose. 6. Assemble the biscuits by spreading half with a little raspberry jam and the other half with a dollop of buttercream then sandwich together. 7. The buttercream will be soft at this point so if you eat them right away, it may ooze out of the sides. This is fine, of course, but if you leave them for a few hours it will firm up and be a bit easier to eat! They look amazing, my daughter is the baker in our house so will pass the recipe on! They look very tasty. I would definitely try and make a batch of these. 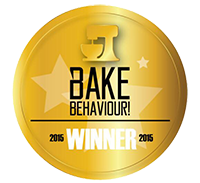 And good tip about the non-stick baking sheets, will have to hunt some down too. These really do look delicious! 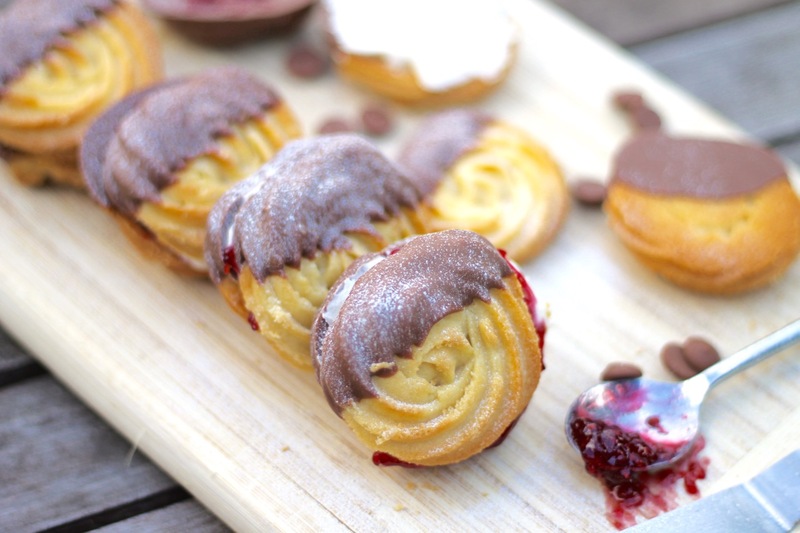 Viennese whirls are my favourite. I've just started using silpat too – they really are worth the money! These whirls look SO delicious!